Giant tuna have been caught in Ireland since the late 1970’s by large pelagic trawlers and there is plenty of anecdotal evidence to suggest that they have always visited Irish waters in late Summer/Autumn. 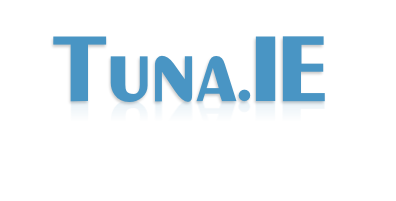 The angling opportunities for tuna became obvious in the 1990’s when large shoals of tuna were spotted on a regular basis in the inshore waters of Donegal Bay. However it wasn’t until the late nineties that a giant was caught on rod and line in Donegal Bay by Alan Glanville. During the following years good numbers of tuna were caught including the current Irish record of 440kg’s taken by Adrian Molloy aboard Michael Callaghan’s boat the “Leah C” in 2001. Significant numbers of giant tuna were caught by angling boats in Ireland in the years 2000 to 2005 including some very large fish between 200 and 400kg’s. 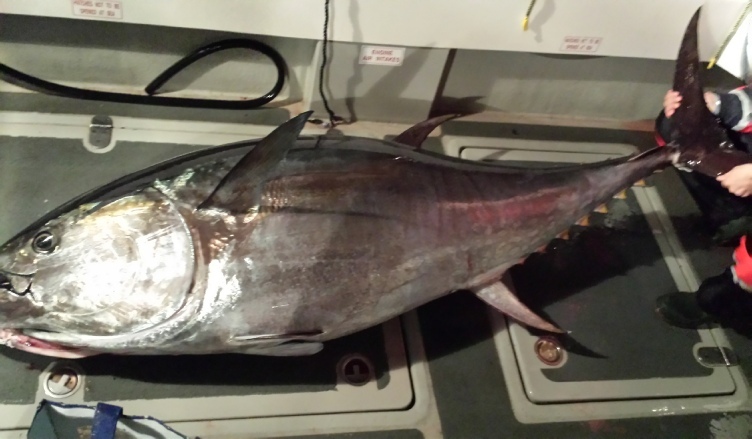 Tuna numbers and angling effort however reduced significantly after the 2006 season. There is no doubt the introduction of tuna fattening “farms” in the Meditteranean and the huge over-fishing by EU vessels in the years 2000-2008 to satisfy the insatiable appetite of these “farms” resulted in tuna numbers declining dramatically making angling for giant tuna very difficult in the years 2006 - 2011. In 2009 the introduction of reduced quotas for Europe by ICCAT and enforced regulations on the fattening “farms” helped reduce the commercial catch from an estimated 40000-60000 tonnes per annum in the years 2000 to 2008 (official quota 23000 tonnes) to just 11,500 tonnes in 2009 - 2011. By 2012 the numbers of tuna returning to Irish waters had increased to levels not seen since the late nineties, in 2013 and 2014 very large numbers were seen in inshore Irish waters perhaps higher than ever seen before. In the past two years substantial numbers of giant tuna have been caught by Irish angling vessels, however in their wisdom the Irish authorities decided to ban angling for giant tuna in Irish waters in 2014 even on a catch and release basis, as Ireland does not have a commercial quota! How catching and releasing a fish or indeed catching a fish for your own use requires a commercial quota is difficult to understand. Are the authorities next going to apply the same way of thinking to other non-quota species? No angling for sharks? No angling for skate? No taking of fish for your own consumption? The mind boggles! Angling for giant tuna is a very valuable resource for Irish inshore angling vessels that also provides a world class fishery rarely seen elsewhere in the world and can provide valuable income late in the season when the number of other angling species are declining. Angling for giant tuna in Ireland and the UK should be actively encouraged on a catch and release basis and supported by the authorities, banning an obvious available resource only serves to drive the fishery into the black economy and into the black market. In 2014 ICCAT decided to increase the European quota from 12500 tonnes in 2014 to 15000 tonnes in 2015 with a further 20% increase year on year until 2017, eventually taking the quota close to the official level of 23000 tonnes which pertained in 2008 when almost double that amount was actually caught. Of this increased quota for the coming years Ireland and the UK receive zero, despite the fact that large numbers of giant tuna are caught and dumped by Irish and UK pelagic trawlers every year. This dumping is brought about by the fact that the Irish and UK authorities do not and have not claimed any of the available by catch quota for giant tuna and the E.U is unwilling to direct part of the European quota to Ireland and the UK. Again hard to understand against an attitude by the Irish authorities that provides a ban on angling for tuna on a catch and release basis. If you are interested in supporting a properly managed fishery for giant tuna in Ireland and the UK you can help by lobbying your local political representative and your local M.E.P. Until such time as a sensible policy is introduced we are still offering charters for tuna fishing on the basis that any giant tuna caught must be released alive to the sea. 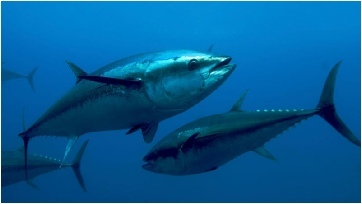 Smaller albacore and bonito tuna may be kept for personal consumption but may not be sold for profit. Further pages relating to the E.U and the nonsense of the Common Fisheries Policy in general will be added to this site in the near future in the hope that someday the lunacy will end. In the meantime your comments (good and bad) are appreciated. Good Fishing, Tight Lines and Thanks for Listening!! Tuna Fishing in 2014 was spectacular! Large numbers of fish in many areas! Larger fish than in previous years! Too many strikes to count!